I will have a few cards to share with you today. First up is this card I created based on CPS Sketch 168. 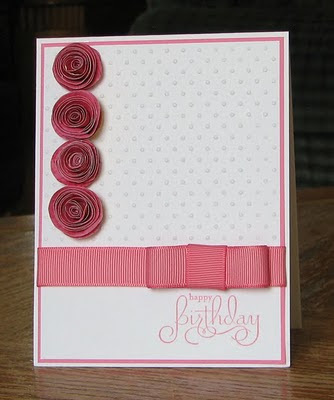 I wasn't sure exactly what to use for the four elements down the side of the card and I was sitting in my scrapbook room with some square scraps on my desk and so I decided to make these rolled paper roses and use them for this card. I decided to do a birthday card for the Little Red Wagon Challenge #30 because I never have enough birthday cards. Cardstock, stamp, ink: Stampin' Up! cute cute cute! those little flowers are just awesome :D love the monochromatic look too! Lovely card!Thanks for joining us at Little Red Wagon!